I'm linking up with Lucky Number 13 again this week for Virtual Coffee Tuesday. If we were sitting down in person to catch up and enjoy a drink, I would love to be at Starbucks sitting on one of their comfy couches drinking a Decaf Vanilla Latte with cinnamon and nutmeg sprinkled on top....yum! But since this is a virtual coffee meeting, I'm sitting on the couch in comfortable clothes with my legs up on a yoga ball since we don't have one of these. Yes, I'm hooked on Pinterest. If you haven't heard about this yet you have to check it out. Just watch out, you may spend a couple hours looking at amazing furniture, recipes, and much more! 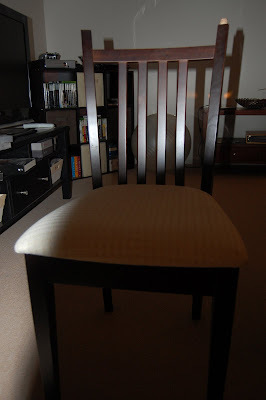 Any ideas to remake this into something or just fix it back to a comfortable chair to sit in? If you have a great idea please share, you might even win something! Have you checked out my post where I told you my Whole Foods Journey? If not, check it out here. I would love to know what you think, if you are working towards eating more whole foods, or if you have any questions. I'm flying home on Friday for a few weeks to do a some things for work. I am SUPER busy this week getting ready for meetings, classes, and trainings I have scheduled for the two weeks I will be there. I am definitely working more then a 40 hours this week. This makes it tough when I have to try and get laundry done, pack, do a quick pedicure ( I cant go with gross feet! ), do my normal chores around the house, and exercise! But I will make it and the reward will be to see everyone back home. So with that I better wrap this up. I have an early morning run tomorrow, so I need to get to bed.